An opportunity. That’s what a trio of athletes were searching for when they started exploring their transfer options this summer after experiencing successful seasons in the Big Ten and NCAA Tournament. It coincided with the arrival of new DePaul head coach Mark Plotkin, who was looking for opportunities to find immediate impact players that would bring leadership as well. He accomplished that goal bringing in former Indiana goalkeeper Drew Nuelle and midfielder Isaac Friendt, who were fresh off a runner-up finish in the NCAA Tournament as well as former Wisconsin defender Brayden Callipari, who helped the Badgers finish the season with a record of 12-5-5. Already midway through the season, Plotkin has been pleased with what the trio has added to the culture, as well as their play on the field. Plotkin added that Callipari and Nuelle have especially helped out on the defensive side of things and have given the team more confidence. 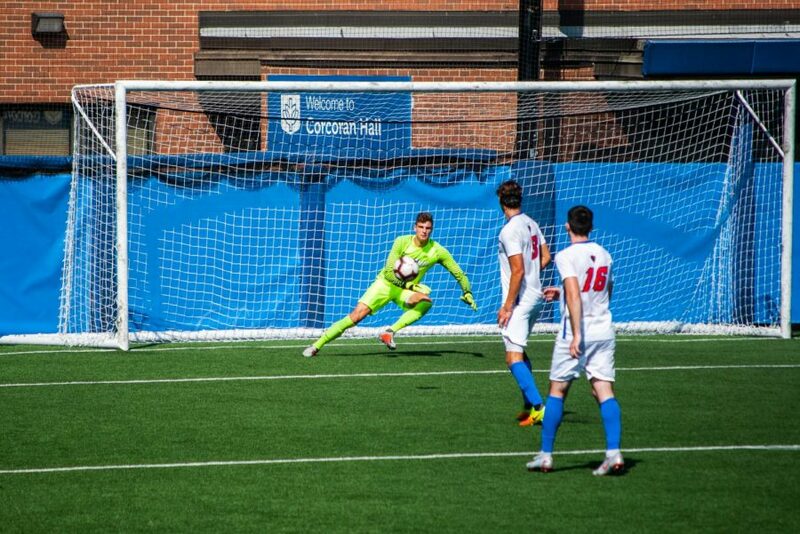 The Blue Demons entered the summer having to replace former goalie Quentin Low, who had started all 18 matches the previous season. Nuelle said he knew the opportunity was there to play early, and so far it has helped him improve as a goalkeeper. “Seeing the field after I haven’t played in two years, so seeing the field again has definitely helped,” Nuelle said. The sophomore goalie has had a solid season, saving over 75 percent of the shots taken against him and allowing less than one goal per game. Plotkin said all the team ever asks of Nuelle is to give them a chance to win. He has already come up with some big saves already this season. The first-year head coach also praised his defense for not allowing a lot of shots on goal and doing what they can to prevent direct attempts on Nuelle. Nuelle’s transition to DePaul was made easier when, his roommate of the past two years, also decided to transfer to the Blue Demons. While the five-foot-eight inch midfielder has missed some time due to injury, he has still tried to make an impact in his first season in Lincoln Park, and so far has enjoyed the experience. Coming from the Hoosiers, the sophomore from Andover, Minnesota has tried to bring a couple of lessons he learned over the course of his two seasons at Indiana. Flanked by his roommate, Friendt has enjoyed his time in the city and bonding with a new set of teammates and coaches. Further strengthening the back line was the addition of Callipari, who grew up in Batavia, Illinois and played for the Chicago Fire Academy for seven years. After appearing in nine games for the Badgers last season, Callipari decided it was time to come home. After winning a Big 10 championship, Callipari said he learned from the team’s winning mindset and is looking to bring that to DePaul where his confidence has risen with more playing time. Callipari has been a steadying force along the backline, appearing in all eight games so far this season. The Blue Demons are off to a good start sitting at 4-4, including 1-1 in the Big East. With all three now seeing extensive action and with three years of eligibility left, their time in Lincoln Park is only just beginning. They now hope to help DePaul return to the NCAA Tournament for the first time since 2008, when their coach was a player with the Blue Demons.